THIS IS A DIGITAL FILE. NO PRINTED MATERIALS WILL BE MAILED/SHIPPED TO YOUR ADDRESS. - Our products are in JPG format and cannot be edited. 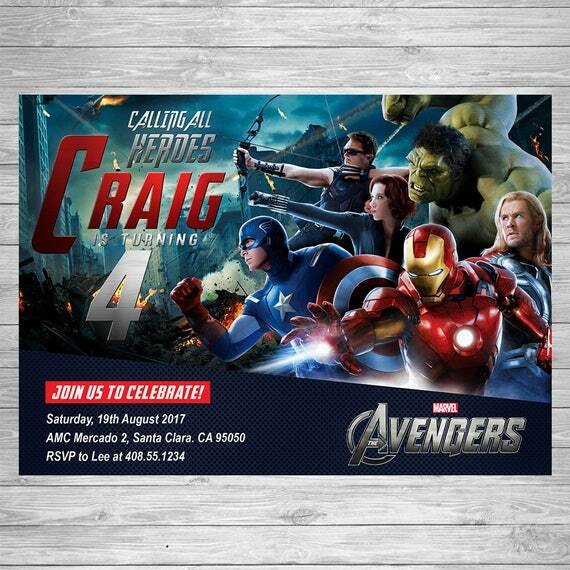 - We will personalize your birthday invitation. Your personalized birthday invitation will come in the form of a 300dpi HIGH RESOLUTION JPG file that will be emailed to you within 24 HOURS after order placement. - You can print the JPG file at home or from a local photo lab or upload the file to an online print shop. It’s very easy! You may print as many as you would like. 1. Purchase listing. Click on Add to Cart and make payment. 3. Once we receive your payment and all the required information, we will begin making your order. Once the file is sent, no refunds will be made. All copyrights of the character images used belong to their respective owners and are not being sold. This item is not a licensed product and we do not claim ownership over the characters used in our designs. This listing is for the time, effort and creativity used to create and personalize your item. There will be NO COPYRIGHT RELEASE from TheAmpersandGallery, so please make sure the printing company you’ll be using doesn’t need any of this. Thank you for visiting TheAmpersandGallery!